Conflict Resolution – Let's Go Be Great! I’ve been thinking about conflict the past couple of weeks. I thought it would be a good idea to share my perspective and some thoughts around the inevitable conflict that arises when humans work together and how to manage it from my perspective. I wrote out the company values in an effort to provide some guide posts around how we should decide things, standards that can be applied to specific situations to facilitate quicker outcomes. For example, caring for our customers or our employees is our first value, then simply any decision which puts that value at risk is off the mark. 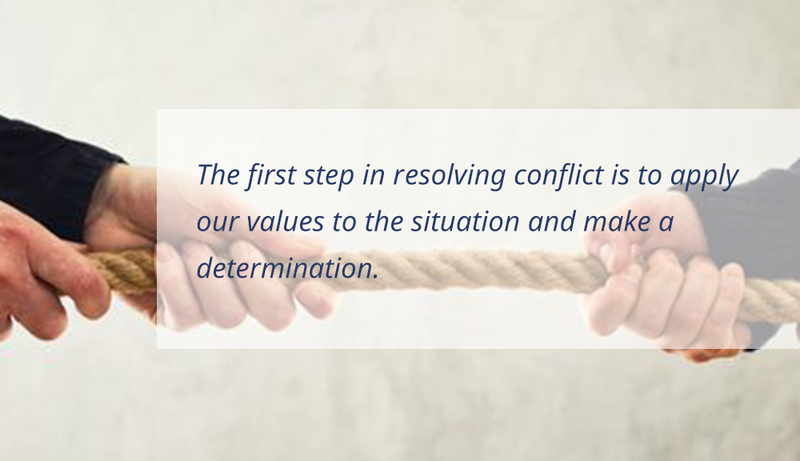 The first step in resolving conflict is to apply our values to the situation and make a determination. A habit I learned a long time ago, which I borrowed from Stephen Covey is seek first to understand and then to be understood. Most conflict arises when two sides are advocating their perspective but not listening to one another. This does mean you won’t disagree with each other but at least you’ll be able to acknowledge the things that you agree upon so you can focus on the differences. While I was at Nordstrom, I managed a lot of customer complaints, more often than not people just want to be heard, their issue to be understood and then real meaningful resolution can begin. No matter how mad I might be… that email I wanted to send in the heated moment never, I mean never is the right thing to do after I’ve had time to think it through. My drafts folder is full of emails that I wrote and never sent. There is something cathartic about writing out your thoughts and feeling but better to have never pushed the send button. Additionally, I’ve found that email is about the worst medium for resolving issue possible, only text messages might be worse… so don’t do it. Pick up the phone and call someone, talk it through and exchange energy and ideas. Emailing is a cowardly way to conduct a disagreement. What are you fighting for? When I get mad I have another habit which kicks in, I ask myself why and I mad? Who and what am I fighting for? It’s tough especially in the heat of the moment, but when I recognize that my issue is about me or how I feel or how I think things should be… I am usually off base. My best energy is spend furthering the big ideas and focusing on the desired outcome. If we agree on the high level goal or objective the we can have a discussion about how to best achieve our goal rather than argue about a way of working. Quantitative decision making, reviewing the numbers and the measurable outcomes is a great way to remove emotional discourse. As I’ve mentioned in the past one of the downsides of qualitative decision making is that it lends itself to a gut feeling which isn’t easily shared. When you want to change the system or a way of working look for some numbers facts or figures that you can use to justify the work and level of effort required for change. My last piece of advice on this subject is to remind everyone that by and large people are well intentioned. They may have a different approach or see the world differently than you but they are working hard, just like you. When I assume that someone is well intentioned then it’s hard to not treat them like valued colleague or friend. My mom used to tell a story about the word “respect”, if you respect someone then you’d “re-look” at them. You’d make sure that your underlying assumptions about them were still valid and if they’d had changed, you would change your perspective too. It’s all too easy to see someone as categorically one way or part of one group when really they are just like you and trying hard in some cases desperately to make things better. We are part of groups but we are individuals. We share a common vision and a common goal… So next time you feel conflict brewing, take a moment of pause and remember you are all on the same team.